Lawrence Grech, former editor of The Sunday Times of Malta, speaking to the youths. Media literacy and critical thinking was the theme of this year’s Eurocourse, entitled Head in the Cloud, which was attended by 24 youths aged between 18 and 25 from Malta, Germany, Spain, Lithuania, Belgium, Denmark, Romania and Slovakia. 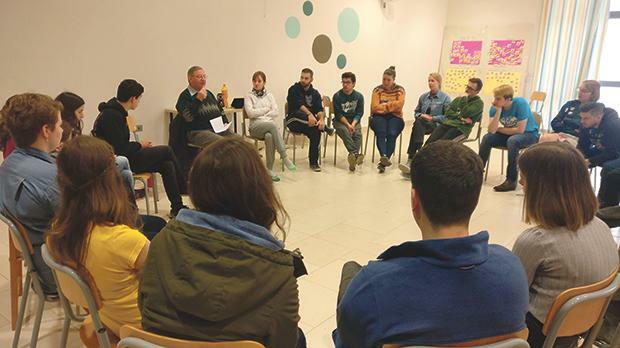 The five-day course, which was hosted by Żgħażagħ Azzjoni Kattolika (ŻAK), a branch of the Maltese Catholic Action, at ŻAK house, Birkirkara, was organised by the International Federation of Catholic Parochial Youth Movements (Fimcap). The course was addressed by experts in media, marketing and journalism. The participants discussed the influence that the media has on people through product placement, how marketing works in different countries, the role advertising plays in society, and how to ‘sell’ or ‘brand’ a youth organisation. A session about journalism was addressed by Lawrence Grech, former editor of The Sunday Times of Malta, who spoke about journalism’s fundamental role to report the truth, about journalists’ code of ethics, and his experience of what journalism entails. During the session the partici­pants learned how to identify reliable sources and distinguish fake news from the truth. During a workshop the participants discussed the effects of the mass media and of information overload, and how to be critical of the news. They also discussed how, due to social media, everyone is considered a journalist today, and the important role of youth leaders to guide and mentor young people in a positive manner. During the course the participants visited Valletta and also held fun activities to get to know each other. The course was supported by the Erasmusplus programme.